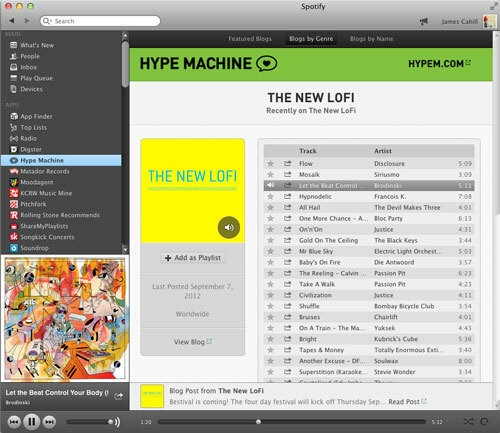 We are big fans of Hype Machine and Spotify over here at The New LoFi, so it was exciting to hear that the two services would start playing together this month. Hype Machine now has a wonderful app on Spotify that lets you browse and listen to the hundreds of music blogs that they catalogue. Go add the Hype Machine app to your Spotify account and start browsing playlists that each blog has put together of their most recent music. Below is The New LoFi’s most recently posted tracks.